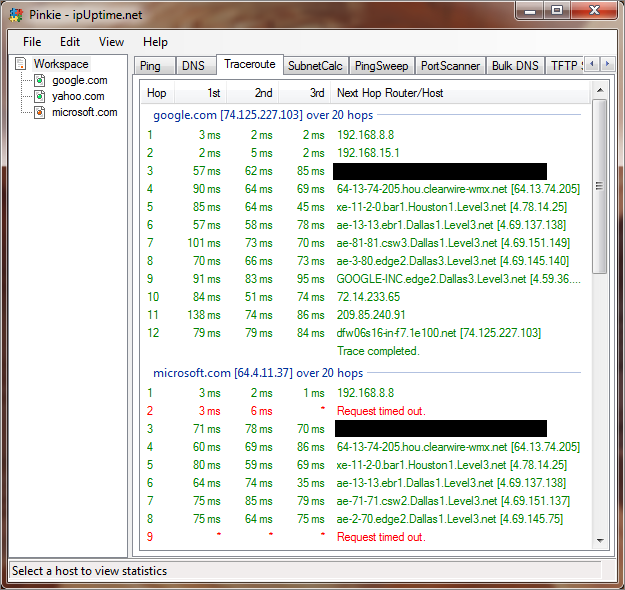 Traceroute can start automatically when you ping a host. Just like the DNS function, the Traceroute function can also be set to run automatically. Everytime you ping a host, the Traceroute function silently runs in the background and figures out the path to the host in question. If you wish to conserve system resources and not have traceroute runs everytime you ping a host, you have the option to turn it off. Of course you can still do a traceroute for a single host or all of them when you want to; and that is as easy as right click the mouse button and start tracing. The Traceroute function in the Command Prompt is nice but it just doesn’t have all the bells and whistles that is built into Pinkie’s Traceroute function. You can log the traceroute results to disk, copy selected result to the clipboard or copy a hop address among other things. As a Network Administrator, one often has the need to perform traceroute to find the last hop router and login to the router. This can be done as easy as clicking on the last hop itself (or any hop for that matter) to copy it. And with all the bells and whistle that comes with the Traceroute function, you have the option to copy the hostname or the IP address itself. Yes, Pinkie is smart enough to figure out the last hop on its own and selectively copy the IP or the hostname based on your preference. And as you might have expected, the One Window, One App architecture is at work here again. Download Pinkie and try it out for yourself.